In his influential book Likeness and Presence: A History of the Image before the Era of Art Hans Belting described a pivotal transition in European art history. The transition began at the end of the medieval period. The Christian use of images to invoke and make sensibly present the invisible God began to be displaced. Over a period of the next three or four centuries, images increasingly came to be seen and evaluated in terms of their “art” and a new aestheticized canon superseded an old religious one. In the flowering of the Renaissance the ideals of mastering visible likeness and idealized beauty might be used to communicate an idea of the Divine, but the experience of Divine presence through an image was largely lost. The Renaissance preference for visual likeness reigned in western art for a long time, but it too was finally superseded. By the mid twentieth century in America likeness was largely held in low regard, as leading artists sought a mythic presence through abstraction. When Catherine Prescott was studying art in the 1960's, the category "art" had no real place for the kind of realism she was drawn too. Her skills as a draughtsman were readily acknowledged, but she was stymied by a lack of artistic options. A summer in graduate school, where realism was acceptable as long as it dispassionately transcribed photographs, convinced her she had no future in the American art world. Prescott became a Christian a few years later. While studying at the L'Abri Fellowship in Switzerland, she discovered that God was not a respecter of such categorical snobbery. She began to paint what she saw and loved - small patches of the Swiss pastures - and ceased to think of her work as art. A bit later, seeing an Alice Neel exhibit, she was struck by the psychological directness of her expressive paintings, and Neel's disregard for prevailing artistic hierarchies. Neel - perhaps to avoid the stigma - called her own portraits "people paintings." Prescott had been drawn to portraits since childhood, and pictures of people constitute her primary subject. Her portraits have received significant recognition. She has had numerous portrait commissions, but also asks people to sit for her because she wants to understand them through paint. For her painting is a way of knowing. 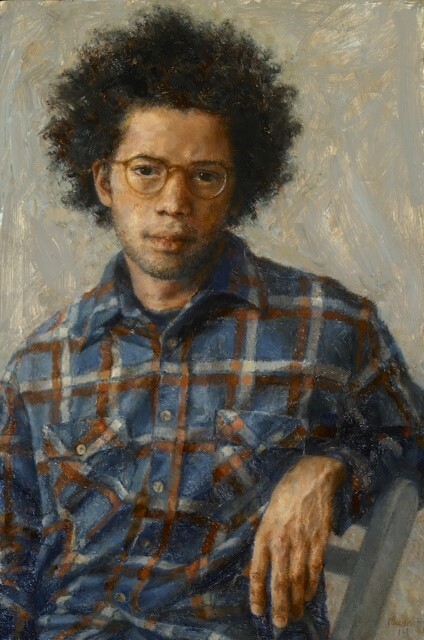 Prescott’s recent exhibit Person at North Park University in Chicago featured a series of small oil on panel portraits, all measuring 6"x9" or smaller. Three of those paintings, Daphne Holding Her Neck, Without Guile, and Casey are reproduced here. Daphne is an artist Prescott met while teaching in Italy, and the young woman in Without Guile was a student of hers. Casey has been a studio assistant for me. Prescott's approach to painting is governed by her pursuit of the character and "interiority" of her subject. She works until her intuitions become visible to her in paint. Since she is committed to close observation, she does not indulge in expressive liberties for the sake of psychological depth. Her searching process requires many revisions and small, barely noticeable adjustments (even to those observing a painting’s development), until she feels the character inside is revealed by what can be seen through the person's visage. The result - which I've watched people respond to and remark upon for over four decades now - is the uncanny sense that she has not only recorded how someone looks, but that she seems to know who they really are. In these paintings she separates portraiture from the common accusation that it necessarily flatters its subject and obscures true character. Prescott has never articulated a specifically Christian purpose for her art, and resists the idea that she has special insight into a spiritual dimension. Perhaps part of what makes her work attractive to people is that her scrutiny is tender and sympathetic. In an age rife with "the hermeneutics of suspicion," and which too easily associates the artist’s "gaze" with an exercise of oppressive power, her work stands apart. She is neither interrogating her subjects nor trying to squeeze them into a typology. 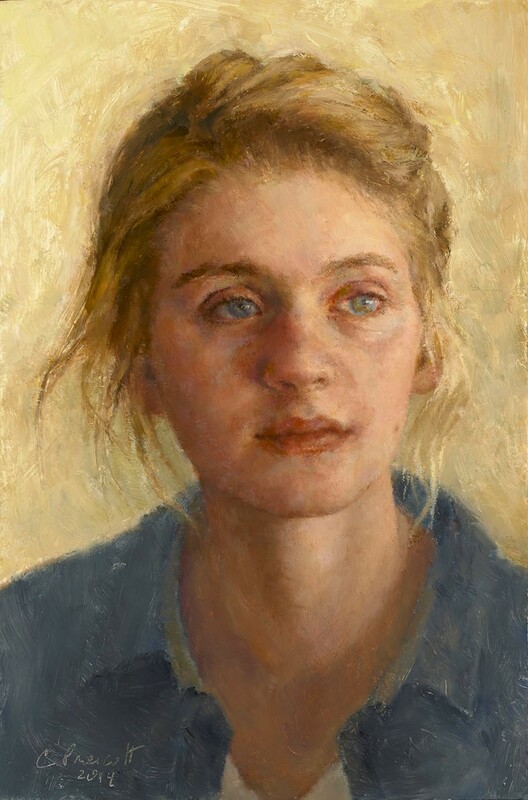 The art historian Karen Mulder has described her approach as “a distinctly maternal embrace for the varying qualities that set individuals apart.” Mulder continues, “While a Prescott painting is a record of a tempered admiration for another person’s existence and essence, it invariably lacks any trace of sentimentality.” Sentimentality – which someone defined as “loving something more than God does” – has no place in her paintings. But a kind of unflinching sentiment permeates Prescott’s work. It is fueled by her conviction that humanity is part of the created order, carries God’s imprint, and is worthy of love. I don’t believe that Hans Belting meant to oppose likeness and presence, as though they could never co-inhabit an image. Nor would I ever argue that Catherine Prescott stands alone in her ability to illuminate character. Yet in an era when the belief that humans are unique is contested, these paintings - direct yet complex, immediate but also fixed, and humble while speaking with quiet eloquence - have a palpable sense of human worth. The British philosopher Roger Scruton has described our age as marked by “defacement,” as various forces and ideologies eradicate our natural sense of the human soul. Prescott’s faces suggest that hidden presence and make human transcendence sensible. I think her particular gift is that she does this without reference to religious content. Transcendence can be felt by people who don’t know its name. Catherine Prescott: Casey, 2014, oil on panel, 22,5 x 15 cm. Catherine Prescott: Daphne Holding Her Neck, 2015, oil on panel, 22,5 x 15 cm. Catherine Prescott: Without Guile, 2014, oil on panel, 22,5 x 15 cm. 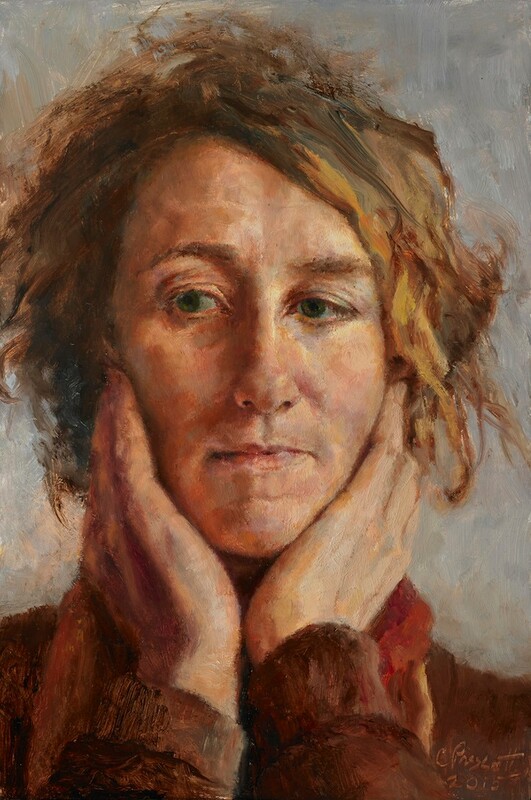 Catherine Prescott has twice exhibited her portraits in the Outwin Boochever Portrait Competition at the National Portrait Gallery, Smithsonian Institution. She has received awards in The Portrait Society of America, the Art of the State, Pennsylvania State Museum, and The Salmagundi Club. She was one of ten painters invited to exhibit in “Inspiring Figures” at the Butler Institute of American Art. Her work has been shown at the Katharina Rich Perlow Gallery in NewYork, the Brauer Museum in Indiana, the Susquehanna Museum of Art and the Phillips Museum, in Pennsylvania. She is associated with Women Painting Women and exhibits with them at Principle Gallery, Alexandria, Virginia. Her work has been featured in The Huffington Post, Image, CIVA Seen, American Arts Quarterly, The Art of The Portrait, and American Art Collector. Her work is represented by Seraphin gallery, Philadelphia. Prescott taught painting and drawing at Messiah College for 20 years, and currently teaches in Gordon College’s Orvieto, Italy program. Her work may be seen at www.prescottpaintings.com. Theodore Prescott is a sculptor and writer who lives near Harrisburg PA. He has exhibited in the United States and Europe, completed several public commissions, and has work in public and private collections. In 1980 Prescott began the art major at Messiah College in Grantham, PA. He chaired the art program for a decade, and was the recipient of two successive terms as a Distinguished Professor of Art. He is an Emeritus Professor of Art at the college. Prescott was one of the founders of the national organization CIVA (Christians in the Visual Arts), served as its third president, and edited its triennial publication for more than a decade. His articles on art have appeared in several publications, including American Arts Quarterly, Image, and The New Criterion. He has edited one book on contemporary figurative art, and written several catalog essays for group and solo exhibitions by contemporary artists. His work and a list of publications can be seen at www.tedprescottsculpture.com.